Last evening, after the summer hiatus, I returned to the church kitchen to cook dinner for our Wednesday Chalice Night program. I hadn’t realized how much I missed it. I started at about 1:00 p.m., first making the filling for 60 black-bean burritos, and then preparing 4 large pans of banana pudding. I gathered up the ingredients for enchilada sauce, packed my car full of food (and my kids), and headed for church at 4:00. 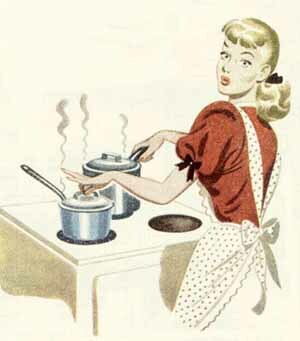 There we were joined by my husband, Jack, and Rita, and we had the usual excellent time as we filled and baked burritos, cooked enchilada sauce and Mexican rice, and dished out pudding. We were ready to serve at 5:30. I love putting together the list of what I need and going on the big shopping trip every week. I love coming to my stopping time for work on Wednesday and moving from computer to kitchen counter to start preparations. I love the cooking, and the serving, and looking out into the church social hall to see tables full of people talking and enjoying themselves over a home-cooked meal. It’s as close to spiritual as I get. If you’re near downtown Louisville on a Wednesday from 5:30 – 6:15 p.m., come by and eat dinner for $4.00 ($2.00 for a small portion; kids under 10 are free). You’ll enjoy friendly company and good, homemade food, and it will truly be my pleasure to greet you at the serving window. I am an intensely nonviolent person. I dislike interpersonal confrontations. If a wasp or spider finds its way into my house, I do my best to capture it and release it outside rather than kill it. One of the reasons we found a new home for our python was that I could no longer bear to feed the snake live rats. I am extremely anti-war; I can’t imagine killing a person, and I don’t understand why and how people choose killing as a means to solve problems or express disagreement. I have no desire to ever touch a gun, let alone shoot one; even seeing a pistol close up on a police officer makes me nervous. And yet… action/adventure movies are far and away my favorite genre. Give me Daniel Craig as James Bond or Matt Damon as Jason Bourne, and you’ve made my day. Big, cool-looking, high-caliber weaponry; good guys who can’t miss; car chases zig-zagging through major cities; some excellent hand-to-hand combat thrown in for good measure: these are things my favorite films are made of. If it’s possible to throw in some semblance of plot and a female character who demonstrates intelligence and the ability to take care of herself, so much the better. It was wonderful. A copy will find its way to my shelf as soon as it comes out on DVD. My limitations lie in the amount of graphic bloodshed and suffering. I prefer the bad guys to be faceless and nameless and to die immediately. A little blood spatter is OK, as is the occasional humorous use of dismembered body parts (such as Clive Owen using a severed hand to work the fingerprint ID on a pistol). But I do not deal well with torture scenes and intense, in-your-face, realistic carnage; I learned what to watch out for many years ago when I saw Robocop and almost got sick. Live Free or Die Hard — Bruuuuuuuuce! About a year ago we bought a new TV. We also needed a new DVD player; but because we were spending way more than we should have on the TV, the DVD player we chose was cheap. We’ve been suffering from that decision ever since. The player skips; it locks up; it refuses to load disks unless coaxed. Tonight, my son and I sat down to watch a movie. I put in the disk, and the panel on the front of the DVD player flashed Load, as usual — but it kept on flashing. And flashing. It’s done this before, so I tried the usual solution: I turned the player off and back on. No luck. I took out the disk and cleaned it. Nope. I opened and closed the disk tray multiple times. Nothing doing: just Load, over and over and over. And he did. He thumped the DVD player firmly on the carpeted floor three or four times, as our son and I watched, amazed. Do I need to tell you that when he put it back on the shelf and inserted a DVD, it worked?